For two years, Teresa Oliver and her son Michael couldn’t go home. They lived in a basement apartment, waiting for their house to be restored. Their Fairfax home had been decimated by termites and water damage and condemned by the city. RT-AFF pulled the community together to help the Olivers, and after months of work, the house was finally ready. On her first day back, Teresa shared her gratitude for the dozens of volunteers who helped save her home. The journey to that hopeful moment was long, and it wasn’t easy. After termites ravaged her home in 2015, Teresa hired workers to help. Instead of helping, they gutted her house, leaving it in worse condition than ever. Posing as licensed contractors, they took her money and left her home in shambles. She didn’t know where to turn. 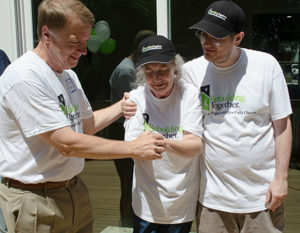 Thankfully, the city’s Human Services Coordinator Louise Armitage connected her with our team at Rebuilding Together. When we first talked to the Olivers, their home was down to just studs and floor joists. No bathroom. No kitchen. No furnace. No plumbing. No wiring. This was the biggest project we had ever taken on. Homes usually need basic repairs and accessibility modifications that take a day or two or weeks at most. This house needed to be rebuilt from scratch. Our Executive Director Patti Klein remarked that it was, “as close as we’ve ever come to a complete home makeover.” “It was an unusually large and complex project for us to take on, and we’re grateful to all of the volunteers, local contractors and suppliers, our funders, partners and City leaders and staff,” she said. They say it takes a village. In this case, it really did. We needed every dollar, every volunteer, every scrap of material, to save the Olivers’ home. 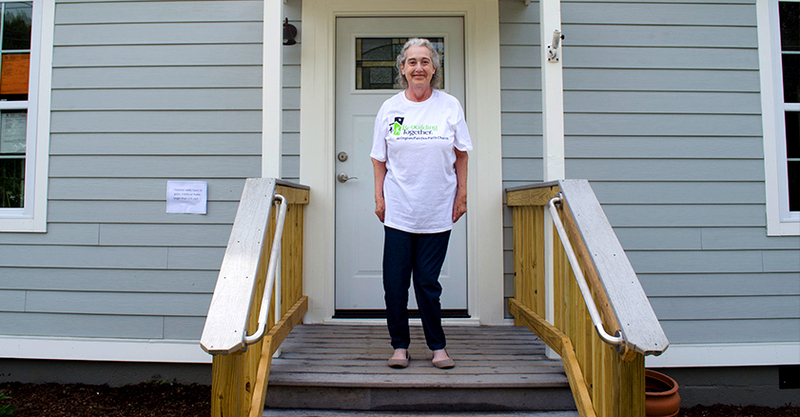 Sixty volunteers donated almost 2,400 hours of their precious time to help rebuild the Olivers’ home. They focused especially on accessibility and safety. Though she had lived in the house for over 17 years, Teresa had always struggled with her backyard stairs. Her painful arthritis made it hard for her to climb the steps. So, volunteers added railings and reduced the height of the steps, making the stairway accessible to Teresa for the first time. “In all the years I’ve owned this house, I have not been able to walk up the steps like a normal human being,” Teresa said. 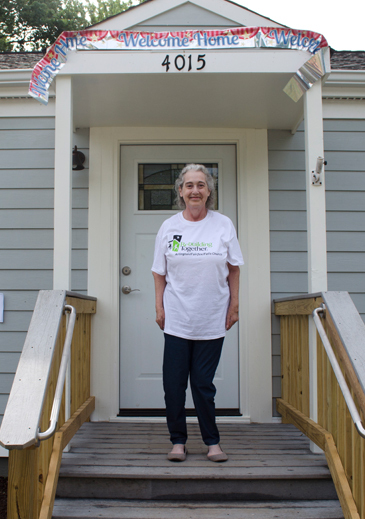 “It was always grab onto the post, one foot at a time, and hope I didn’t fall.” Now, the steps are no problem for Teresa. Working from the ground up, contractors and skilled volunteers installed new plumbing, electrical and HVAC systems in the home. The volunteer team made modifications to prevent water damage, which had attracted termites when the house first fell into disrepair. Fairfax County Home Repair for the Elderly program staff installed gutters and downspouts. Volunteers dug ditches and installed drainpipes to divert water away from the house. They also spent close to 100 hours cleaning the crawlspace, and installing vapor barrier and insulation to keep the home warm, dry and moisture-free. Wells Fargo Housing Foundation donated the single largest grant for the project, and 16 of their employees helped with the rebuild. They added fresh coats of paint, and tackled landscaping work in the yard. We loved their enthusiasm and willingness to get their hands dirty! Volunteers Jim Dillon and Lou Wood put in an extraordinary amount of time on the project. They mentored many of the volunteers, and together the team transformed the shell of a house into a safe and healthy home. Many donors and volunteers joined RT-AFF to make this project a success. C.B. Lucas secured a donated HVAC system from Trane and then donated the time and materials to install the system. Nino Rocha, Master Plumber, did an expert job replacing the plumbing in the house. Walsh Electric and employee Cesar Jordan rewired almost the entire home. Mid South Building Supply, Inc. donated and installed kitchen cabinets. Volunteer Justin Tirelli worked for three days tiling the bathroom and an entryway. We’d like to extend our sincere thanks to all of the volunteers as well as our sponsors who supported the rebuilding effort: Wells Fargo Housing Foundation, City of Fairfax, Rotary Club of McLean, Fairfax United Methodist Church, C.B. Lucas Air Conditioning and Heating, Trane, Nino Rocha with F.J. Hooks Plumbing Inc., Walsh Electric, Mid South Building Supply Inc., Tirelli Tile and Renovations, Home Energy Medics, Merrifield Garden Center, and a host of individual donors. We’re proud how our community pulled together to make such a difference. We hope Teresa and Michael enjoy many more years in their rebuilt home! Do you want to help neighbors like Teresa and Michael? Give to Rebuilding Together, and you can change someone’s life!